Sonic Pi v2.0 competition for schools is launched! The deadline for this competition has been extended till 9th January 2015. This week, Dr Sam Aaron released the much anticipated final version of Sonic Pi v2.0. It will be replacing Sonic Pi v1 on Raspbian very soon, and you will be able to get it via our Downloads page (we will let you know when). In the meantime, you can follow the instructions at the bottom of this post to download and install it. The latest version of Sonic Pi brings music creation and performance to the forefront with live coding capabilities, parameter modification, samples and much more! 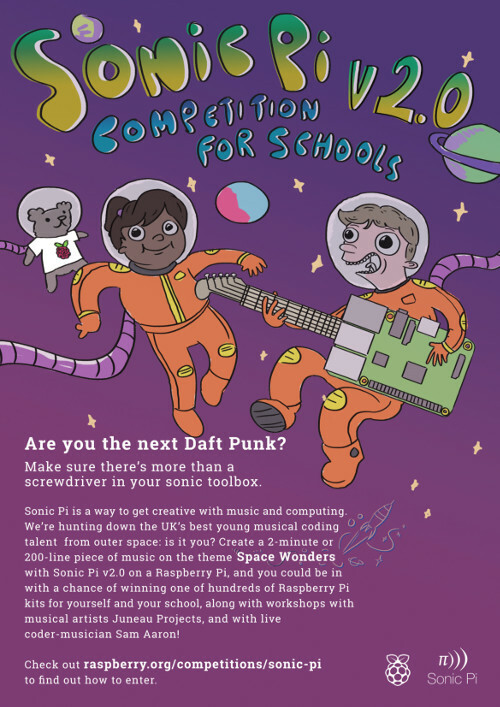 To celebrate, we have launched the first ever Sonic Pi Competition to find some of the best space-themed music, coded with Sonic Pi v2.0 by school children in the UK. The Sonic Pi Competition is designed to encourage school students aged between 6 and 16 years old to use their creativity and coding knowledge to create a unique and original two-minute piece of music on a Raspberry Pi device. Entries need to include an audio file of what the music sounds like, the code used to create it, a short written description, and a cover art file. All entries will be put into a hat to win a Raspberry Pi and SD card at random. Semi-finalists will win a Sonic Pi half-day workshop with Sam Aaron and Juneau Projects for their school, and a custom Sonic Pi Pibow case. Overall winners in each category will win a Sonic Pi classroom kit containing 25 x Raspberry Pis and peripherals for their school and a Minirig speaker, as well as a Sonic Pi Competition trophy designed by artists Juneau Projects. The final will take place at the Cambridge Junction on 4th November 2014 as part of the Sonic Pi Live & Coding Summit, with the 12 semi-finalists (four in each category) introducing and playing their music on a Raspberry Pi to the audience in front of an expert panel of judges. You can find everything you need know, including some lesson plans to get your students started, in this new Sonic Pi Competition Resource. You’ll find the entry form here. The deadline for entries is 13th October 2014, so get creative with your code, and become the next big thing in music! Boo. I live in the USA and I’ve been really looking forward to entering this contest. That’s a real issue I’ve noticed with the Linux world, is that most of the good things (or at least the ones I’m interested in) are based in the UK/EU. That really stinks for me over here, and it’s part of the reason I love the Raspberry Pi so much, is that the foundation made is so they are easily available in the US. Hey ho, oh well. At least Sonic Pi 2.0 has been officially released, hope to mess with that soon! The astronaut with the guitar was modelled on Ben, right? Post says competition is for 6 to 16 year olds – yet the entry forms give options for only KS 2, 3 or 4. Any change of adding KS1 please? Will the piece of music be judged by running it in live in Sonic Pi, or by the recorded .wav? In the first round it will be judged by the recorded sound. Then the code will be looked at and run from Sonic Pi on a Raspberry Pi. Hello any body able to tell me how to get the children work off of the pi? Ive tried putting the SD card into a windows computer and nothing happens. Carrie Anne says she’s mailing you now! I did my submission for entry this competition. Is there any way to check if the submission is received. My 8 yr old son submitted an entry to the Sonic Pi competition at the beginning of Jan. We haven’t received an email confirmation. Is it possible to get a confirmation of receipt and find out when the results of the competition will be announced? HATs in the wild. And a unicorn.